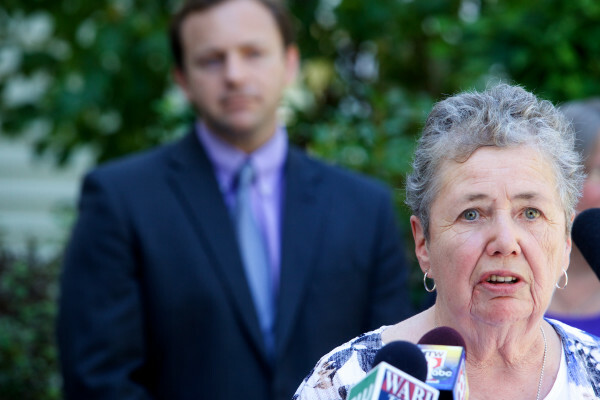 Lee Picker, 75, speaks at a news conference in Brunswick on Aug. 20, 2014, where Maine House Speaker Mark Eves. D-North Berwick, announced a series of proposals designed to build more affordable housing for seniors and otherwise help them remain in their homes as they age. AUGUSTA, Maine — In November, Maine voters will decide whether or not to spend $100 million on transportation and housing for low-income seniors. Question 3 will ask for $85 million in state borrowing to help maintain bridges, roads and other modes of transport, while Question 2 will propose borrowing another $15 million to fund projects for seniors across the state. Both questions address needs in Maine and they’re well-timed to pass, but the transportation bond might have the best chance given the state’s history. The transportation bond would cut a shortfall in the maintenance of state infrastructure. Republican Gov. Paul LePage has been criticized for holding back other types of voter-approved bonds, but he signed the bill that put Question 3 on the ballot and his Department of Transportation is behind it. This bond would dedicate $68 million to construct, replace or rehabilitate bridges and roads and $17 million to ports, harbors, marine transport, aviation, transit and rail, according to the LePage administration. It would be matched by $121.5 million in federal and local funds. Maine’s roads and bridges have gotten poor marks in recent years, with the state chapter of the American Society of Civil Engineers giving them respective grades of D and C- in 2013. The MaineDOT’s three-year work plan has identified a $119 million annual gap between funding of roads and bridges and what is needed to maintain that network. Department spokeswoman Nina Fisher said that plan was developed assuming a bond issue that would allocate $32 million to roads and bridges, so Question 3 would reduce the shortfall to $83 million. The housing bonds would build or weatherize more than 300 homes for low-income seniors. House Speaker Mark Eves, D-North Berwick, proposed a $65 million bond in 2014, but it was reduced to $15 million by the time the Legislature approved Question 2. LePage criticized the idea, but it passed without his signature. The bond would be administered by the Maine State Housing Authority and be matched by $22.6 million in private and other funds to support construction of more than 200 housing units for low-income seniors and weatherization of more than 100 existing homes owned by low-income seniors, according to the Maine attorney general’s office. Maine, with a median age of 44, is the oldest state in the nation, according to Census data released earlier this year. A study commissioned by the coalition found a shortage of nearly 9,000 affordable housing units for low-income seniors in 2012 and said if no action is taken, that will balloon to 15,000 by 2022. Bonds usually win in Maine and the timing makes these even more likely to win, but the transportation bond could be a better bet. Between 1990 and 2014, Maine voters passed 82 percent of bonds, according to a study by James Melcher, a University of Maine at Farmington political scientist. They did even better in lower-turnout fall elections in odd-numbered years, winning nearly 85 percent of the time. In addition, transportation bonds have passed 15 of 18 times since 1990, but the ones that lost called for narrower investment in ports, rail, oil tank removal and state sand and salt facilities. Melcher called a broad-based bond “a prohibitive favorite to win” in an email. There’s less precedent for something like Question 2. The last Maine bond proposal like it was in 2001, when voters approved $12 million for affordable housing and housing for domestic violence victims.